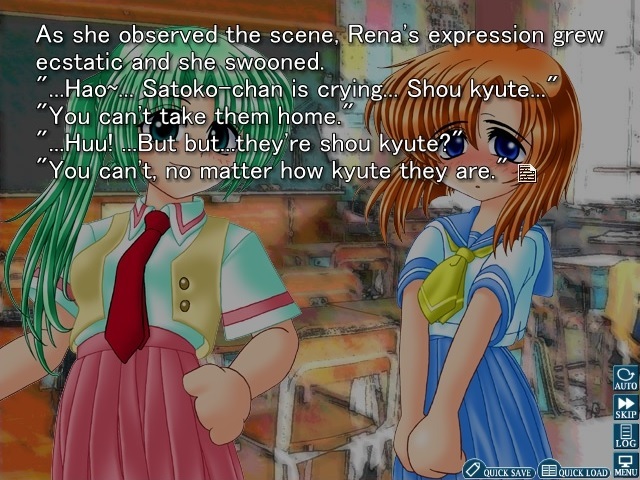 I was lead to believe that Higurashi was about mystery and murder. Soon I learned that it was accurate, but not in the way that I thought. The mystery came from wondering why I hadn’t played the game earlier, while the murder (almost) came from laughing so hard I couldn’t breathe. 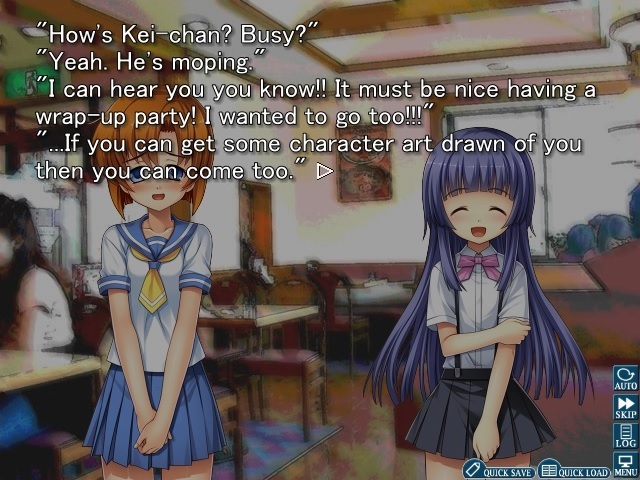 Somehow the most momentous bout of laughter came from a clash between two characters without sprites. How can anything in the game top the principal’s super human skills? It seemed like such a waste that the game didn’t use CGs or at least give Keichii his own sprite. The girls’ happy and mischievous sprites fit so well with their club antics. There’s something charming about the original artwork, and that something can only be described as “shou kyute”. Only when the writing clashed with the artwork did I use the new artwork option to its fullest. Tomitake-san was described as being fit and tanned, but I couldn’t take his pot-bellied sprite seriously. Despite that small problem, it took a complete change in atmosphere for me to fully appreciate the new artwork. Once the story really got going, the new artwork felt like a better fit to the mystery and horror sections. By the end of the game I was comfortable with both sets of artwork, and they each had situations they were best suited for. With the way Onikakushi exceeded my expectations, I’m excited to find out how Watanagashi turns out.